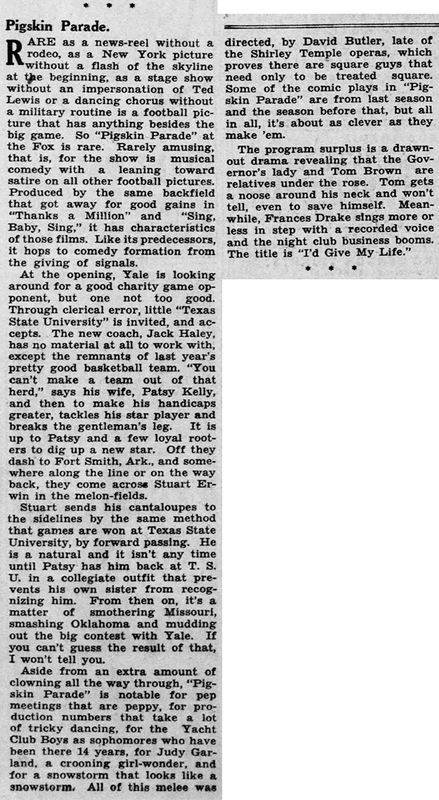 October 25, 1936: A review and article about a day on location for the cast during filming on Pigskin Parade, currently in theaters. 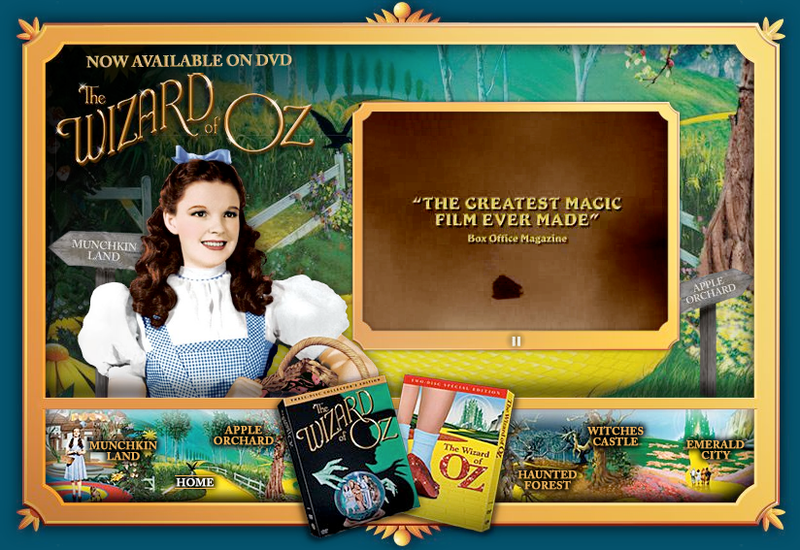 Check out The Judy Room’s Filmography Pages on Pigskin Parade here. 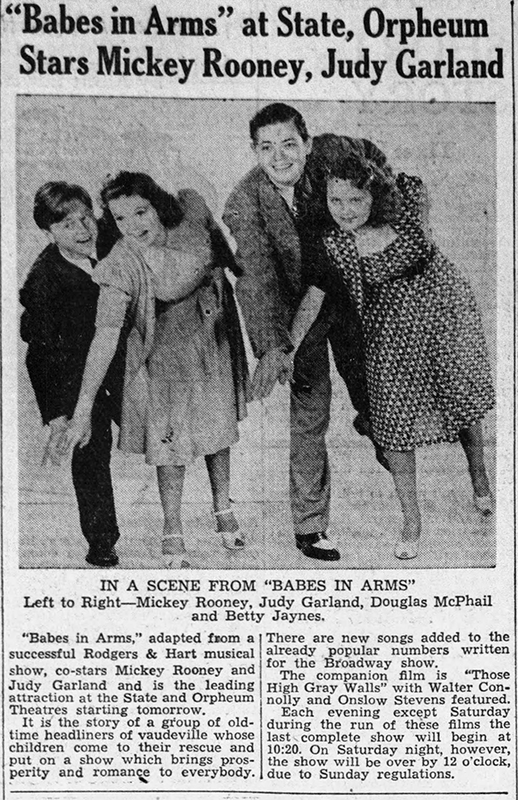 October 25, 1939: The very first of the Mickey Rooney/Judy Garland “Let’s Put On A Show” musicals, Babes in Arms, was still bringing in the crowds and was so popular it was being held over for an extra week in some markets. 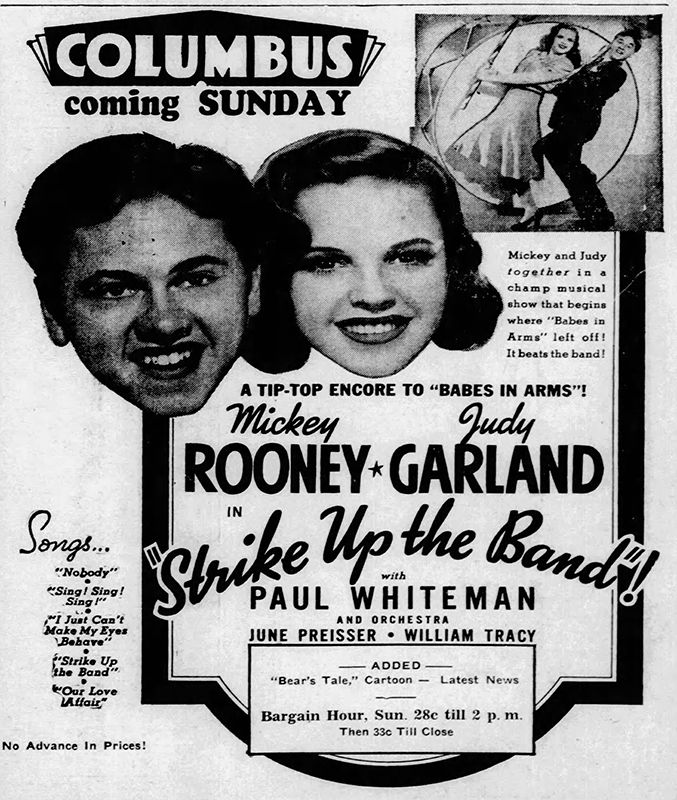 October 25, 1940: A year after Babes in Arms brought the first Mickey Rooney/Judy Garland “Let’s Put On A Show” musical to the public, the second film in the series, Strike Up The Band, which was not exactly a sequel but was close enough, was performing as well as the first. 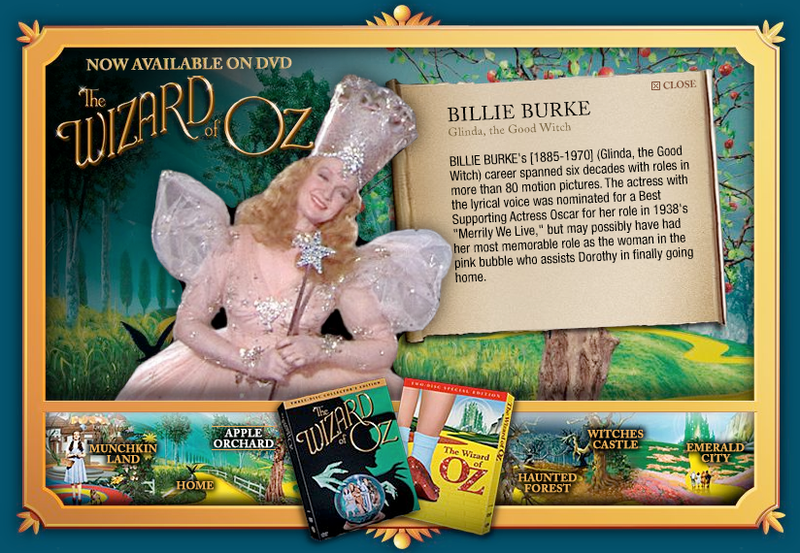 October 25, 1942: Child stars grow up. 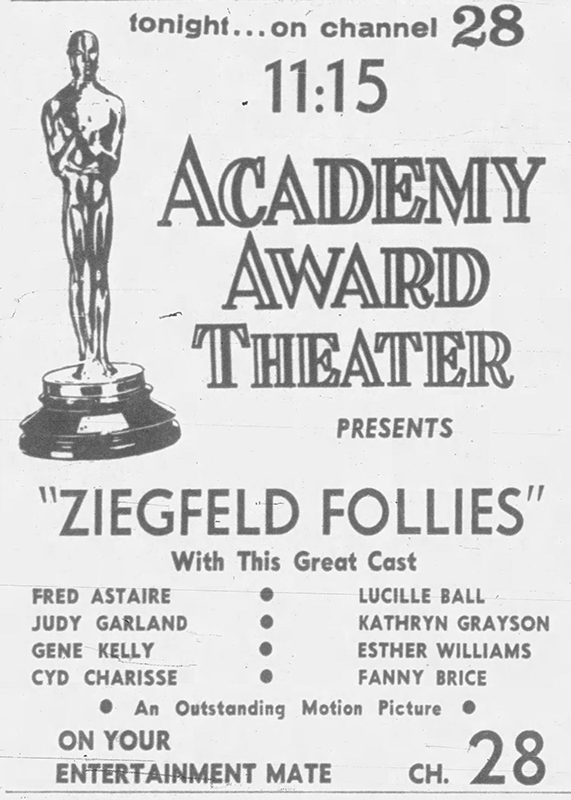 It’s a good thing that Judy’s listed considering her first real grown-up role in For Me And My Gal was currently in theaters proving that she could hold a film on her own, with only her name above the title. 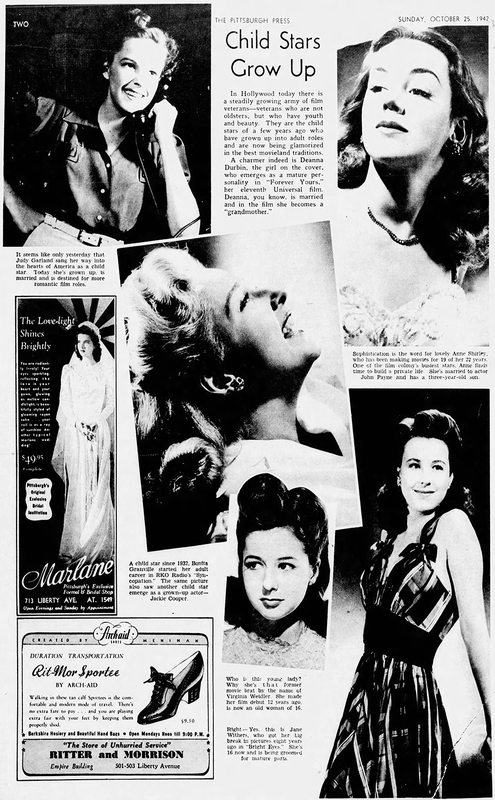 October 25, 1944: The Clock filming continued with more scenes shot on the “Interior Church” set/ Time called: 10 a.m.; time dismissed: 6:20 p.m.
October 25, 1945: Filming on Till The Clouds Roll By continued with more filming on the “Interior Stairs” set (the “Who?” number). Time called: 10 a.m.; Judy arrived at 10:50 a.m. dismissed: 4:30 p.m. Check out The Judy Room’s Extensive Spotlight on Till The Clouds Roll By here. 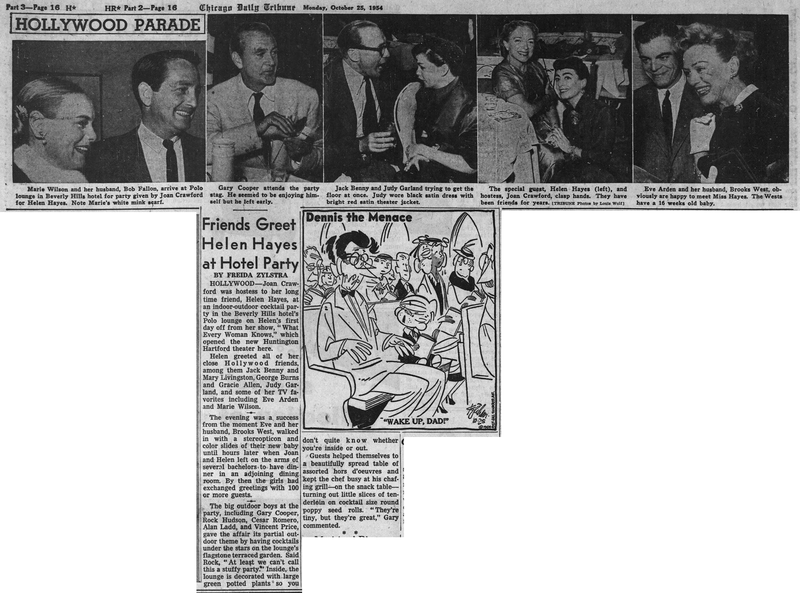 October 25, 1954: The Chicago Tribune published these photos and accompanying article which featured a photo of Judy chatting with Jack Benny during a recent party given for Helen Hayes at the Beverly Hills Hotel polo lounge in Beverly Hills, California. 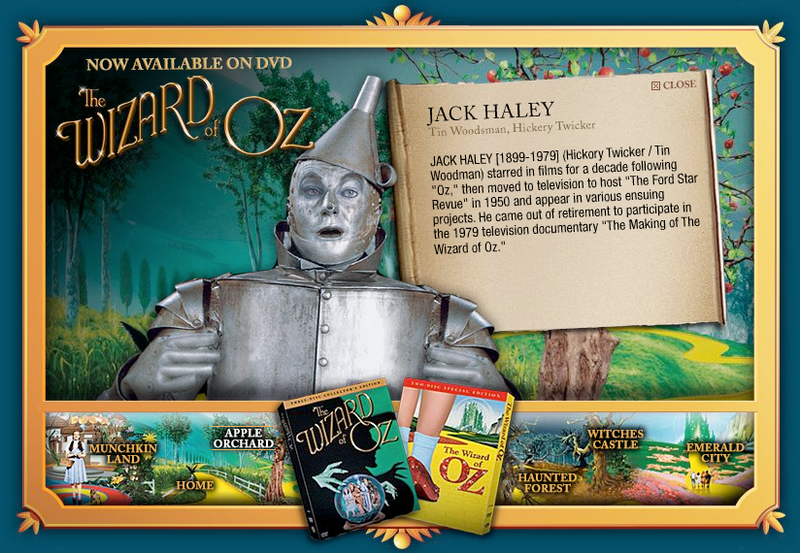 The party was celebrating Hay’s being ack in Hollywood for the play “What Every Woman Knows.” Twenty years earlier, Hayes had starred in the 1934 film adaptation of the popular James M. Barrie play. This event at the Beverly Hills Hotel must have happened over the previous weekend because on this day (October 25th) Hayes opened the show in San Francisco. 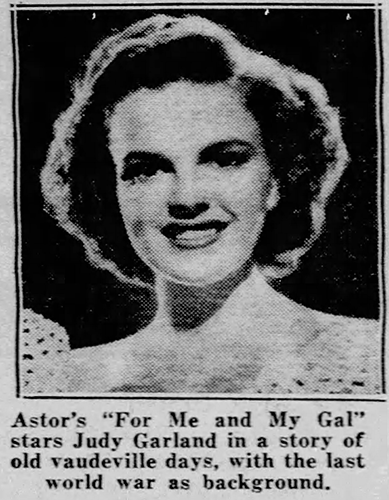 October 25, 1958: Many of us remember “the good ol’ days” when the only chance we had to see Judy’s films were via “The Late Show” and other local incarnations of weekly (sometimes daily) programs. 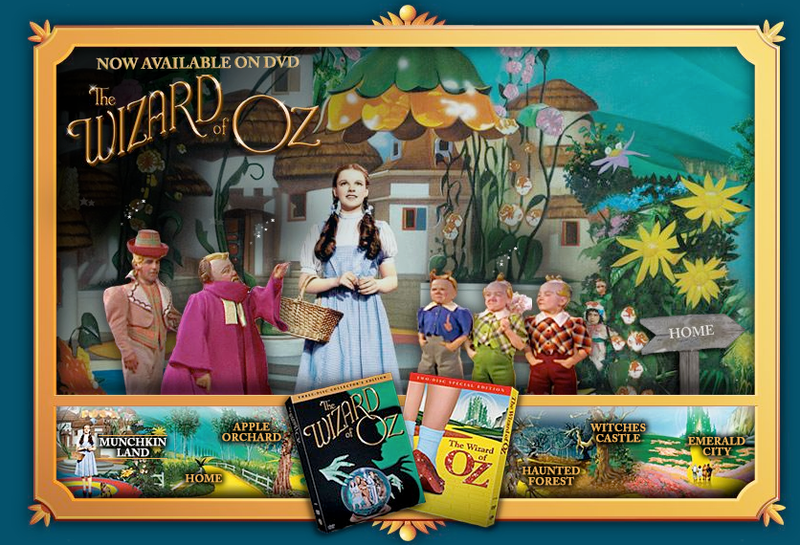 These were usually hosted by a local film critic or TV personality, complete with commercial breaks. Sometimes the film prints were not of the greatest quality and they were sometimes edited, but that’s all we had! 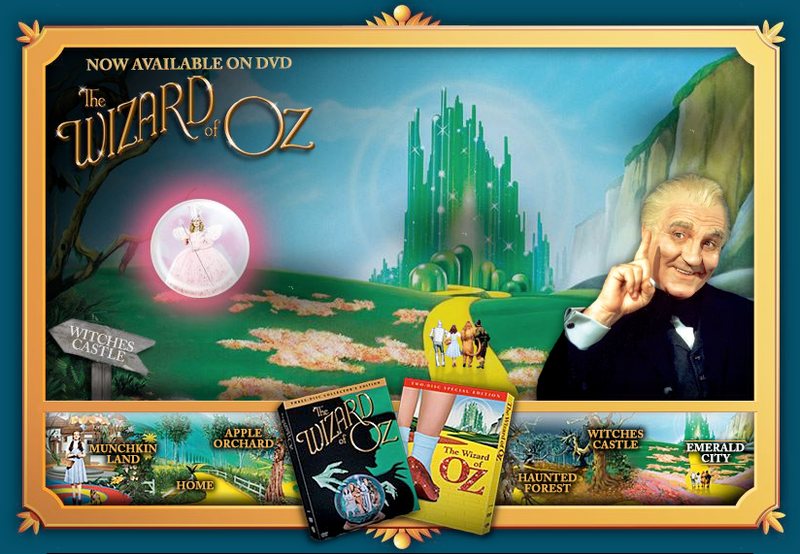 How many people remember staying up late or setting their alarms to get up at 1 or 3 am to watch a Judy film on local TV? 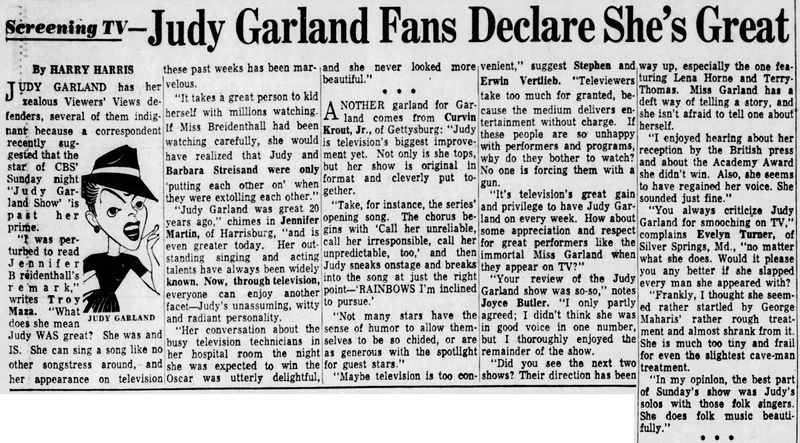 October 25, 1963: Judy’s fans come to her defense from the critics of whom the negative critiques were in the minor but still, Garfans are protective of their idol. In this case, the fans were 100% right. 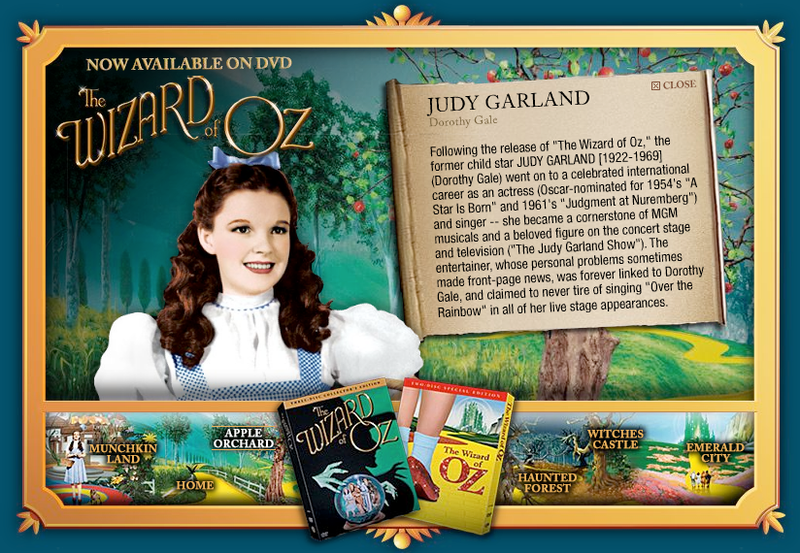 Also published on this date is this review of “The Judy Garland Show” by Harriet Van Horne. 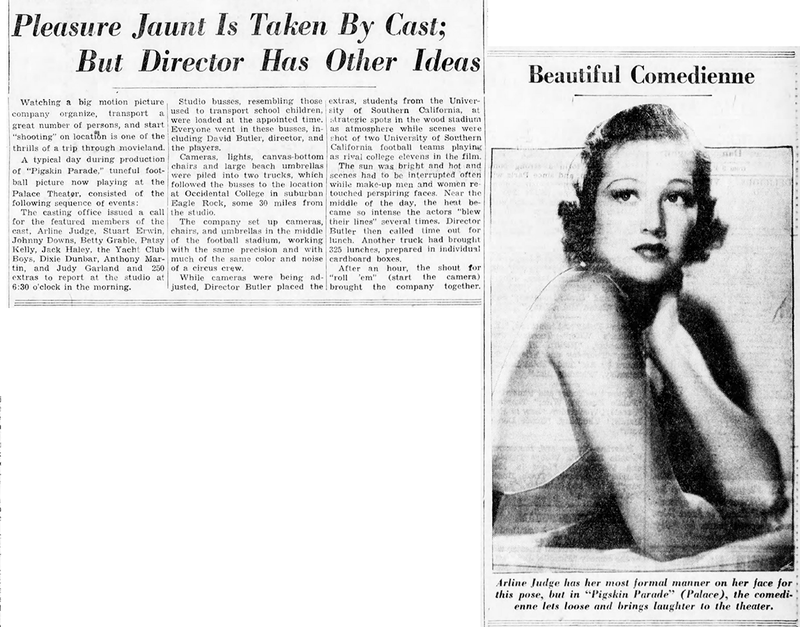 Ms. Van Horne notes that CBS isn’t doing Judy any favors with the format. October 25, 1968: From 2 to 5 a.m. Judy sang four songs for a crowd at the Improvisation nightclub on West 44th Street. At 5:30 a.m. Judy and Jenny Wheeler (who Judy had recently introduced as her secretary) became the houseguest of John Meyer at his parent’s apartment at Park Avenue and 84th Street. Meyer had met Judy the day before at the Carnegie Hall of Richard Striker. 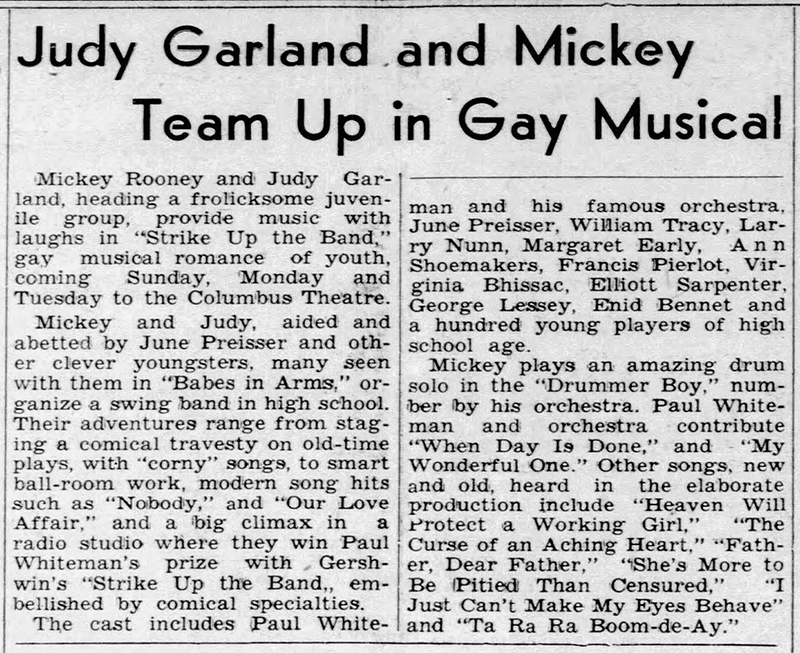 A short while later, according to Meyer, he and Judy became lovers. 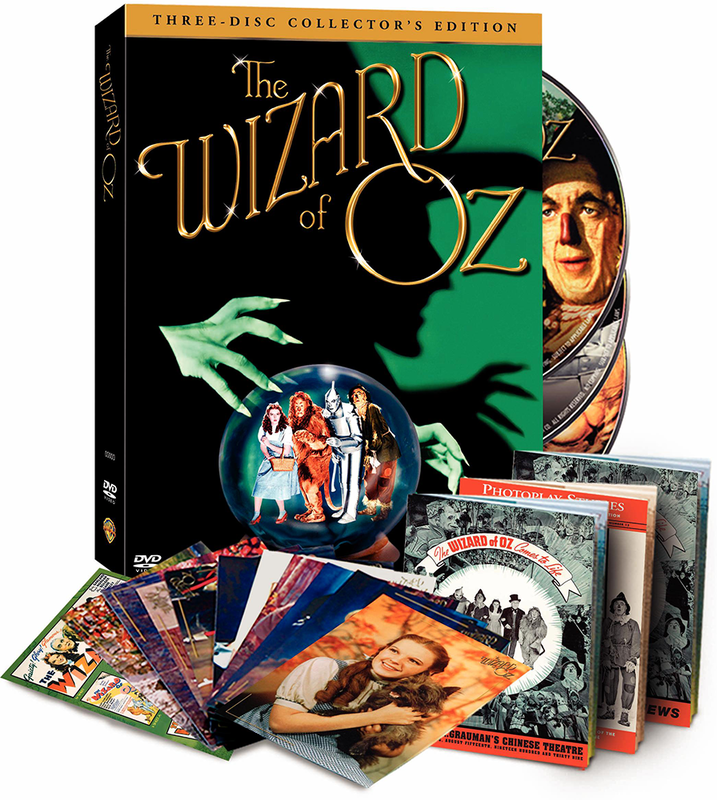 October 25, 2005: The Wizard of Oz finally got the deluxe DVD treatment with two special editions sets, one a 2-disc set and the other a 3-disc set with tons of extras both digital and on paper. 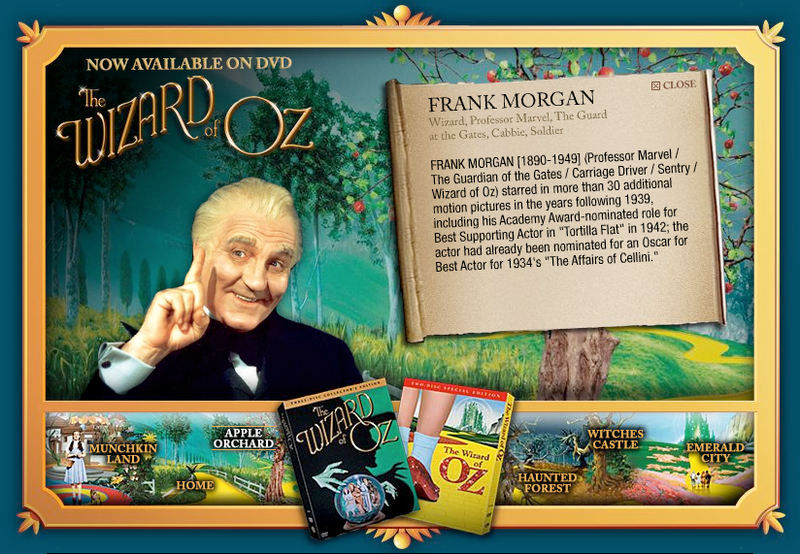 The previous DVD edition of the film was a single disc release in 1999 which was inferior in quality. 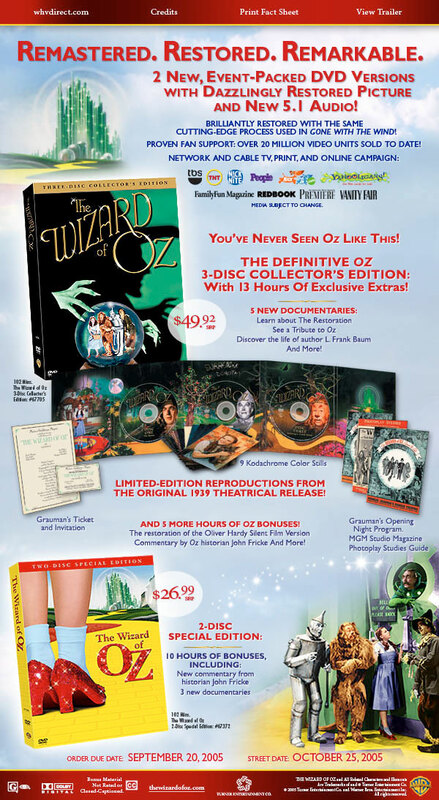 Details about the 3-disc set are here. 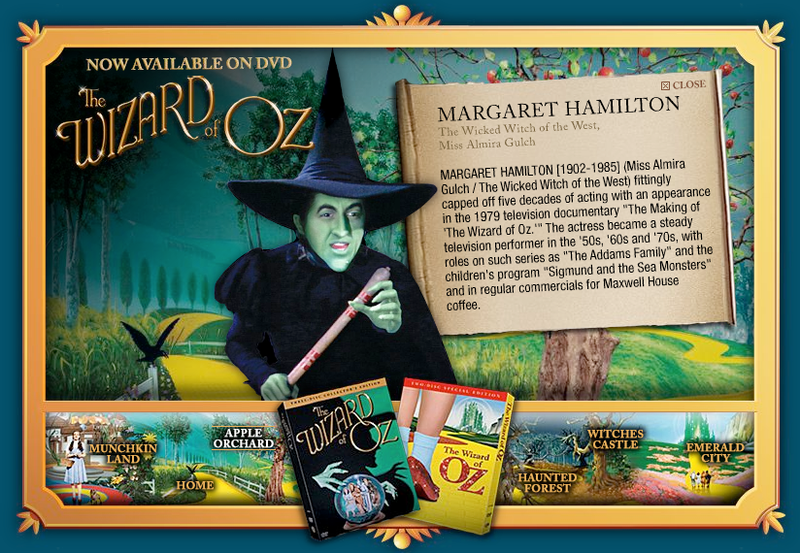 | Details about the 2-disc set are here. 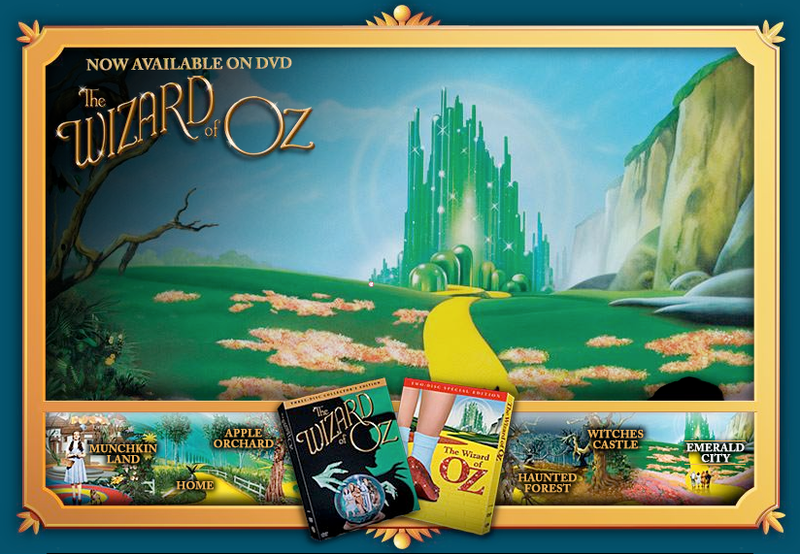 The official website got a much-needed overhaul as well. It’s since been changed again. 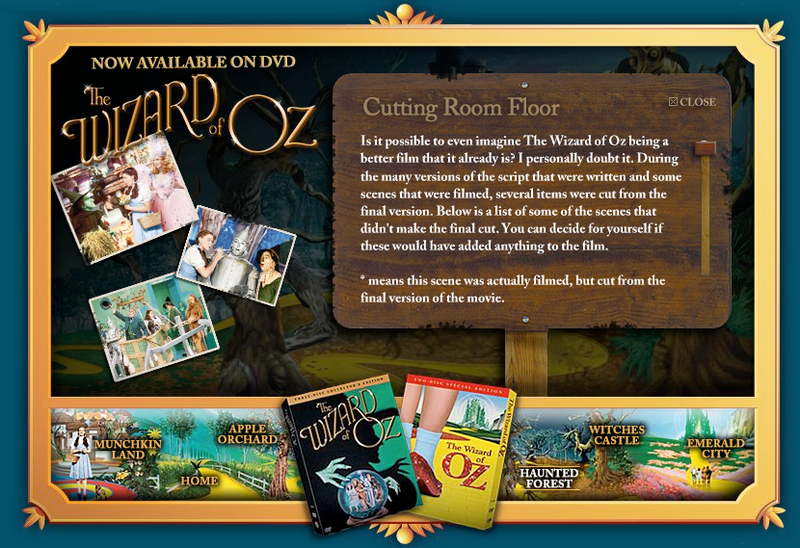 The screenshots below show some of the 2005 site’s features. 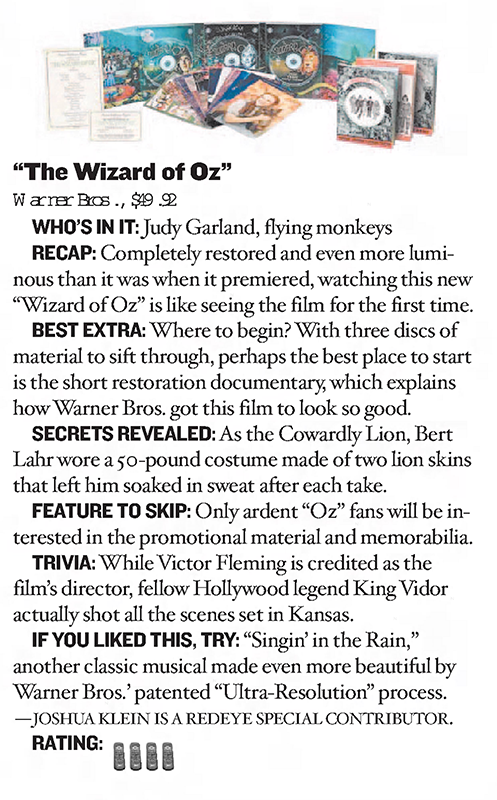 Yes, I recall the days of the weekend’s “Movie Greats” (here in L.A., they’d run, say, “Words and Music” at 5:00 P.M., then repeat it that night at 11:00 P.M. Sunday night, was “Best Picture Show” at 6:00 P.M. These were on KTTV channel 11. 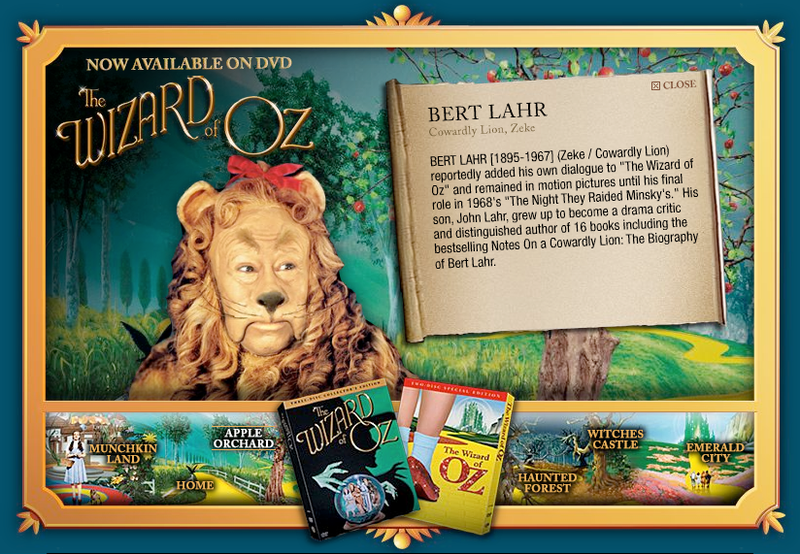 During weekdays, we had “Ben Hunter’s Matinee.” He’d run films, sometimes uncut, so as to stretch out his three-hour show with commercials and adoption segments!! He’s wear his cardigan sweaters and hold his coffee mug. Those were the days! 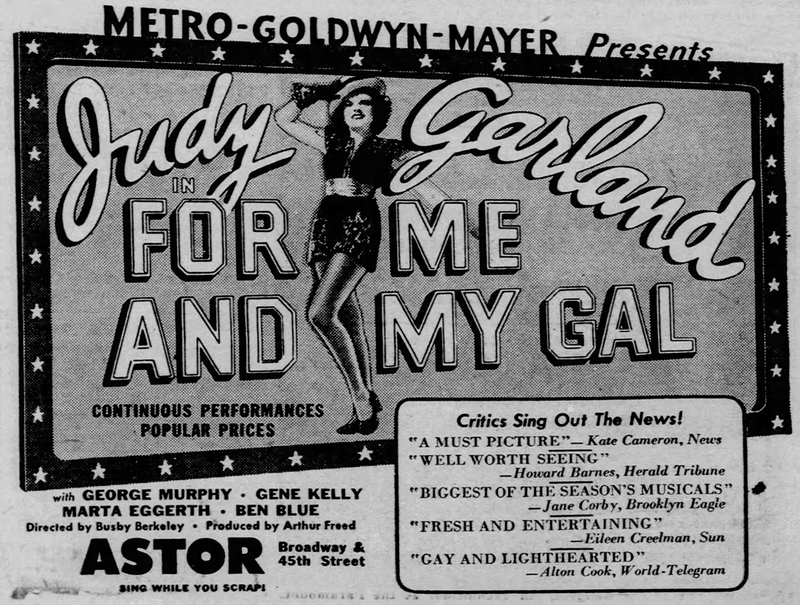 One must also remember that “For Me and My Gal” is really Judy’s first adult DRMATIC musical. It’s very dark, and can hardly be called musical comedy. Like “The Clock”, its themes involve war, marriage, and the struggle against time. 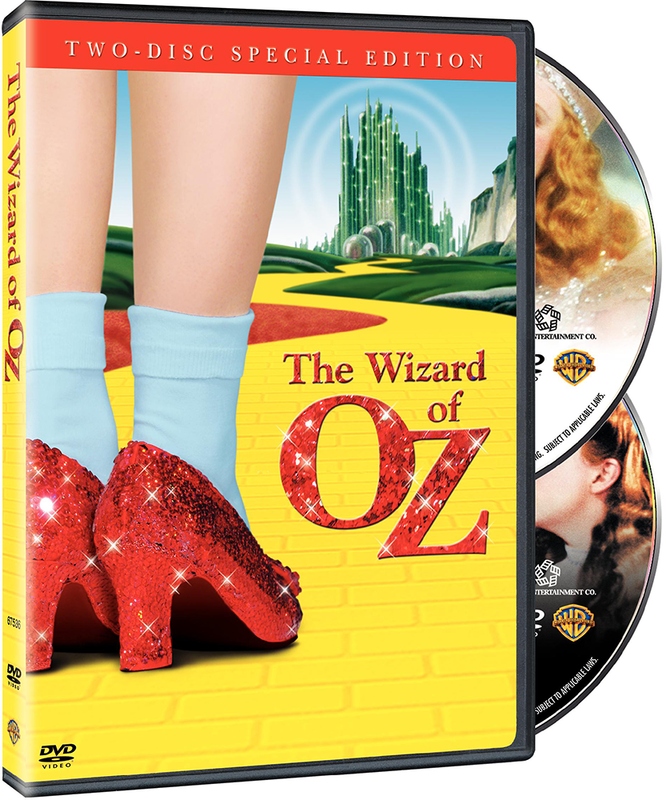 It is corny in the end, but it contains a spectacular performance by Judy, who was slim and beautiful, and whose voice had matured greatly.